Alex Jennings has been a recurring guest star on ABC’s sitcom THE GOLDBERGS for four seasons and has been a member of the JRS community since 2014. 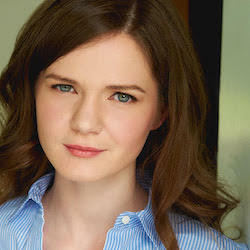 She studied with the Eugene O’Neill Studio and graduated from Circle in the Square Theatre School in NYC. Recent credits include ABC’s SCHOOLED and a recurring guest star on CRIMINAL MINDS. Favorite NY/ Regional stage credits include, Emily in OUR TOWN, Nina in THE SEAGULL, and the Queen in RICHARD II.